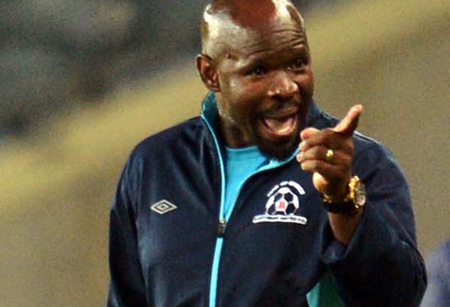 Maritzburg United coach Steve Komphela believes it was the physical conditioning together witn the attitudes of his players that saw United over the line against Orlando Pirates. The Team of Choice edged to 2-1 victory over the Buccaneers at the FNB Stadium on Tuesday. While chances were missed to add a third goal, United also found themselves under the kosh against a Pirates side desperate to take something from the game. But the PMB side showed great guts and character to hold out for the win, much to Komphela’s delight. “The second half was all about grinding. Beyond any tactical approach, it is a willingness of the team, wanting to bounce back, allowed by their physical condition,” said Komphela after the win against Pirates. “You can never play a match of this nature, defend for so long without good physical conditioning, because to an extent it works on your mental capacity. That’s why we are screaming strong mind, strong mind, because when the body gives up, the mind starts giving up as well,” he added. The fitness of the Maritzburg squad will certainly be put to the test in the weeks ahead in what is a very busy Absa Premiership schedule ahead of the Christmas break, starting with Friday (5 December) night’s home game against AmaTuks at the Harry Gwala Stadium, 20H00 kick off. Maritzburg United coach Steve Komphela believes it was the physical conditioning together with the attitudes of his players that saw United over the line against Orlando Pirates.